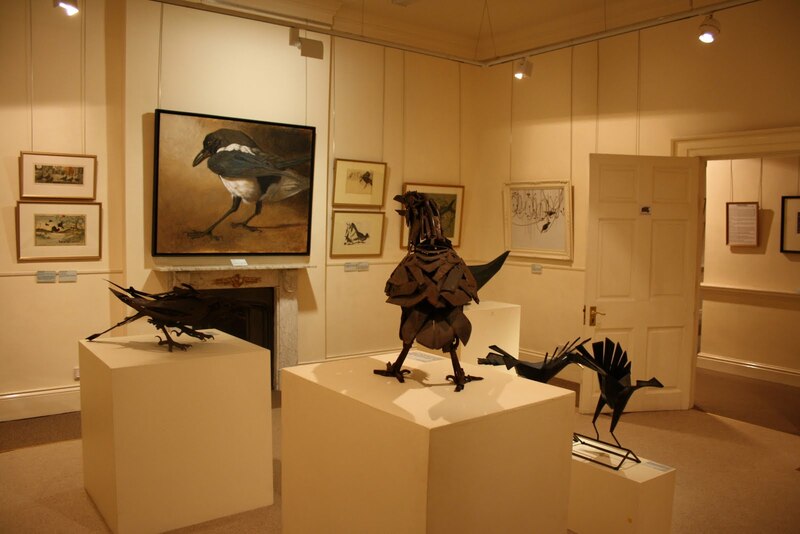 I heard yesterday that Nature in Art, Twigworth, Gloucestershire - www.nature-in-art.org.uk have extended their exhibition, Choughed by an extra week. This gives anyone who wants to see it until the 21st November. A bit last minute I know, but worth the effort. I have to say for those who like all things Corvid it is a gem of a show, sculptures, prints and paintings are on display, I feel really honoured to be part of it. Here is a taster of what you will miss if you can't get there this weekend. together with the bronze inspired by the drawing. 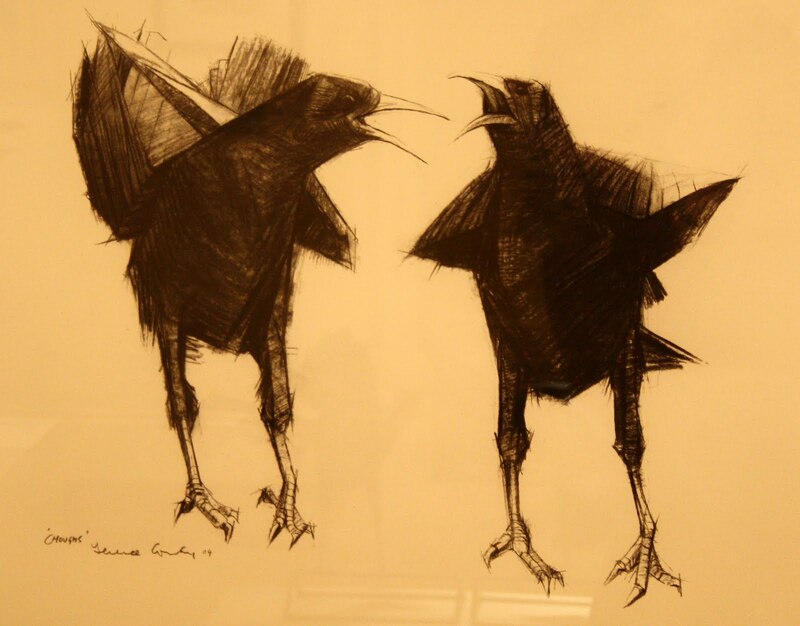 Both capture the argumentative nature of Choughs, the Cornish cousins of crows. One of my favourite sculptors at the moment is Harriet Mead, I saw her work at the Society of Wildlife Artists exhibition at the Mall Gallery, London this summer and I am delighted to be able to take a closer look at her work in this exhibition. 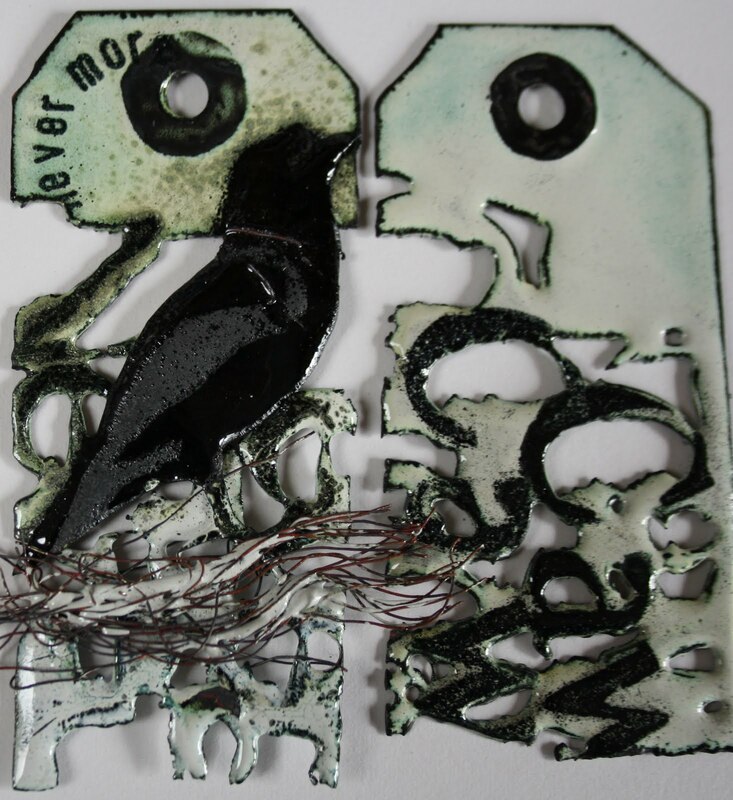 I am intrigued by the way artists use scrap and see images in them. This sculpture is by Nathan Jones, there is great strength and character in this raven and I particularly like the rust and the red...something I am exploring in my own work. 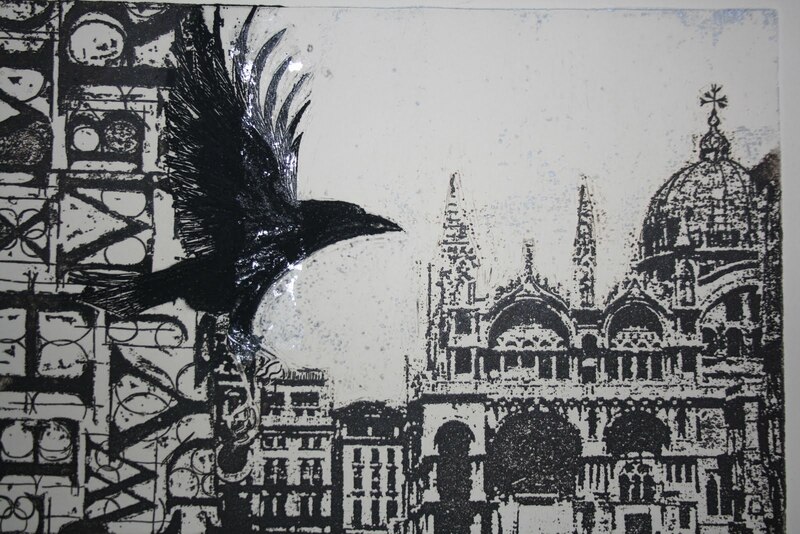 There are several lovely prints on show, a number of Greg Pooles block prints. I like this lino print by Thelma Sykes, after seeing this I was inspired to be more creative with the use of orange in my own work. 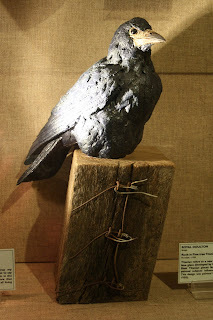 I really like combining materials and this piece of ceramic sculpture works so well. Rook, by Simon Griffiths puts together, ceramics, wood and found barbed wire. Bryan Hanlon has shown the less attractive side of the magpie, nature in tooth and claw. 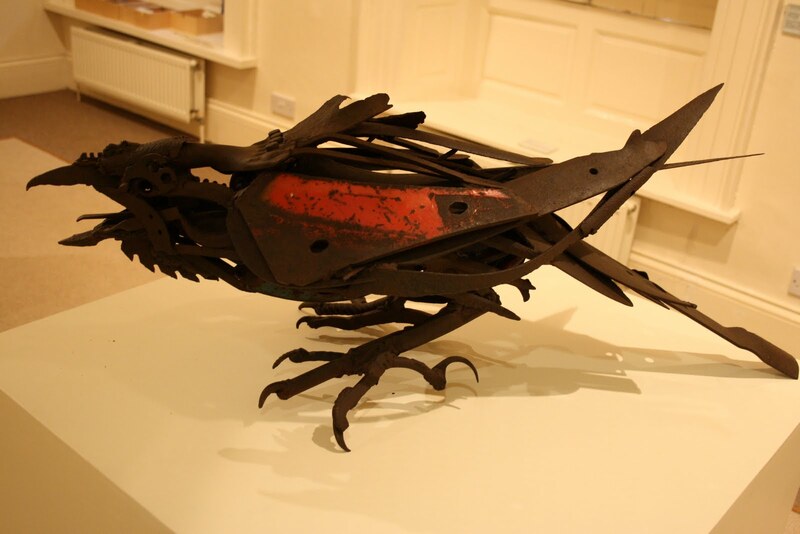 The way he has incorporated the metal shears together with the egg in it's beak gives this piece a narrative. 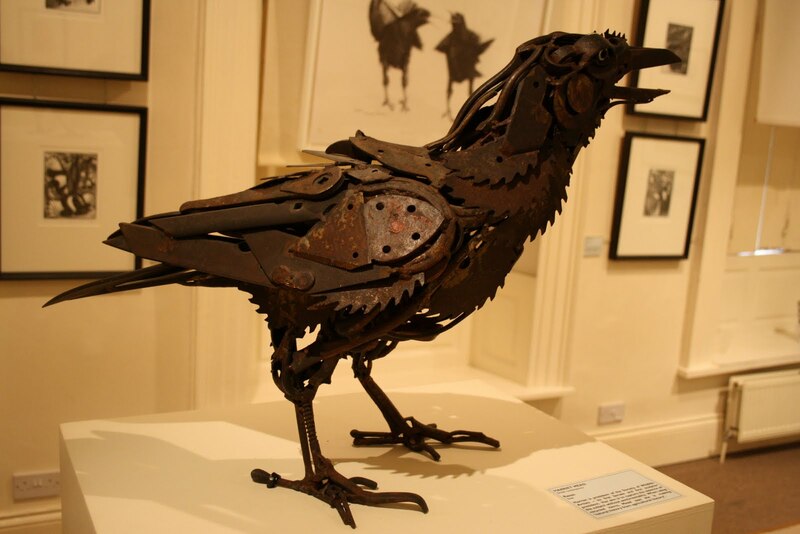 This bronze is available to purchase, as are many of the other pieces in the exhibition. 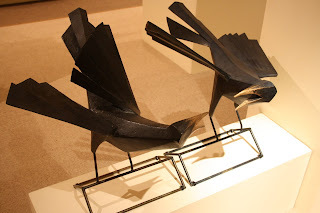 If you cannot get to Nature in Art this weekend I urge you to visit it another time, there is always interesting work on show and the cafe does great cake. 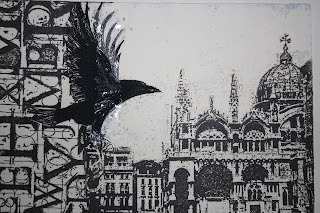 I do love all things Corvid and didn't get there so I appreciated your photos. I also in love with your enamels in the last post! This exhibition looks like my dream show, but I'm stuck in Northern Ireland and can't get to it :( so yes, thanks for the photos! Thanks for sharing, looks fantastic. 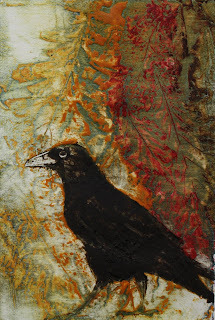 I may be biased, as blackbirds have long been one of my favorite motifs in my own work, but it was quite a pleasure to come across your post - thanks for sharing your wonderful work and that of other artists, too. I thoroughly enjoyed browsing through the beautiful art in this post. Loved every piece! Thanks for sharing. what a fantastic exhibition! I was researching choughs for my own paintings and found your site. Your print work is stunning...I'll have to come back when I have more time.